the last couple of days have been quite nice. friday evening started out wonderfully. after a really nice pizza (with enourmous amounts of cheese) i was off to stockholms stadion together with stefan, erika and catrin to enjoy the dolly parton concert. she was great of course, although i was a little bit dissappointed with her choice of repertoire. not enought bluegrass, too much 80’s pop hits. but dolly is dolly and she was professional and funny as always. and she still has an amazing voice. 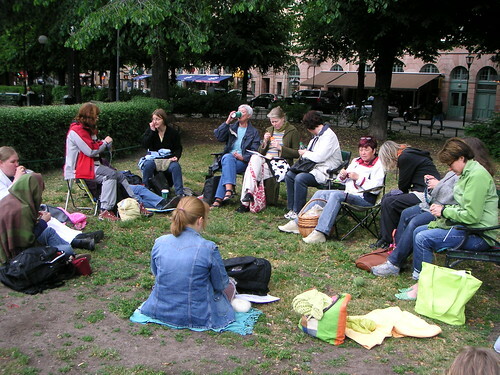 saturday was a bit chilly so our world wide knit in public gathering was after a while forced inside due to rain. quite a few brave knitters stayed outside at mariatorget at first, but i felt rather cold so fled to the warmth and cosy atmosphere at marias garn straight away. 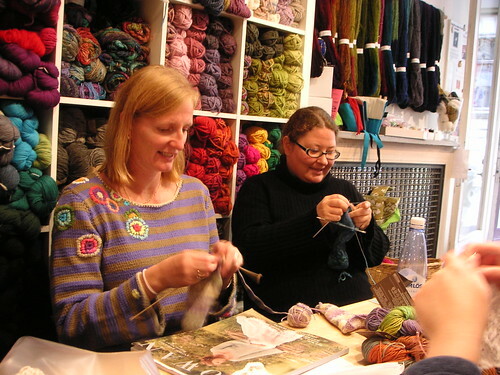 when the rain poured down, some of the outdoor knitters joined us at marias garn, others took refuge at a nearby café. i came home with some very nice ecological cotton yarn. i plan to knit elspeth from rowan 37. i have a lovely dress that will look fabulous with a small cardigan (bolero?) like that. the knitting experience contunued on monday at nysta where i spent some money on a yarn sale. who can resist seven balls of lovely pink debbie bliss cashmerino dk at a very reasonable price? one ball of green debbie bliss rialto wanted to come home with me too. for some lovely edging on whatever i will knit out of the pink cashemerino dk. the visjö yarn from östergötlands ullspinneri is really wonderful, it’s so soft and easy to knit with. satoko mentioned in a comment that the visjö yarn does pill a little, but it’s only to be expected with this type of wool (“finull”, but i don’t know how to translate that, does anyone know?). i only have a few centimetres to go on the ribbed botton edge before i’ll begin the striped body part. i suppose i should be knitting something in light and airy in cotton since we’ve had such warm weather here recently. but somehow i’m much more in the mood to knit wooly jumpers. tonight it’s the start of the fourth season of foyle’s war, one of my favourite tv programs, and it always inspires me to knit nice and wholesome jumpers and slipovers. i’ve come quite far on the hemingway jumper and i’ve started the steeks for the sleeve openings. i’ve also cast on for the aston jumper and i’m very pleased with it so far. i hope it will fit, i’m quite tired of ripping out the things i knit. i am trying not to rush my aston jumper. i know from experience that when i try to knit something of my own design, i usually end up with something that’s too big. so, i’m taking this new project one step at a time. i’ve made a swatch (in the round, of course), i’ve cut it, washed it and blocked it. the next step is to take some new measurements and then calculate the right amount of stiches and decide on the shaping details. i don’t want to end up like i normally do – having to rip everything out about four or five times and starting everything over. i mean, you might remember how many times i’ve cast on for the hemingway jumper, right? i don’t. five? six? i’d like to avoid that if i can.